In this part of Gardeners HQ we take a look at some of the jobs that are necessary to do in the garden in May. The May gardening jobs have been split into four main sections. The first three sections are aimed at people living in the Northern Hemisphere and the last one aimed at those living in the Southern one. Soil is beginning to warm up at this time of year making it an ideal time to sow out the following seeds: Beetroot, Broccoli, Cabbages, Carrot, Cauliflower, Celery, Chives; Coriander; French Beans, Kale, Leek, Lettuce, Parsley, Parsnip, Radish; Rocket, Runner Bean; Spinach, Spring Onions, Turnip and Watercress. (It is a good idea to do repeated sowing of the above to ensure a prolonged harvest). If transplanting cabbage then put a felt base around them to protect their roots from cabbage root fly. It is still not too late to sow out many annual flowers. It is a great time of year to plant out ornamental grasses. It is a good time to put planted baskets out. It is a good idea to first put them outside in a sheltered area so that plants can become acclimatised to the weather before transferring to the final location. 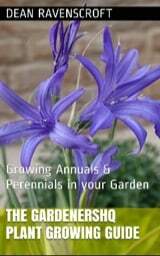 It is still not too late to plant Gladioli corms. Prepare purchased Summer bedding plants by putting them outdoors in the daytime, then bringing them indoors in the evenings. Plant them out towards the end of the month when there is little chance of frost and the soil has warmed up sufficiently. Courgette, Cucumber, Squash and Tomato seedlings can be transplanted outdoors from the greenhouse towards the end of the month as long as the soil is dry. It is a good idea to harden them off first by using a cold frame. New aquatic plants can be put out and established ones can be divided. Time to start weeding; dig deep to remove all the roots of perennial weeds to ensure that you do not have to do this job all summer long. It is a good time to cut back shrubs that have finished their spring flowering such as Chaenomeles, Kerria, Orsythia, Pyracantha and Ribes. Lavender bushes should also be given a good pruning. 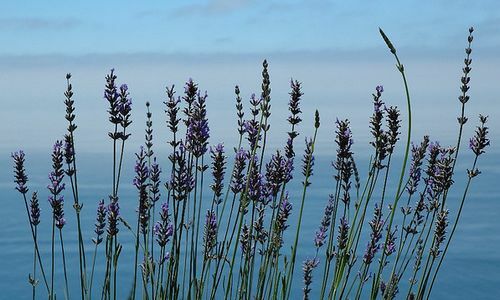 Remove dead wood and cut back by a third to help increase the lifespan of Lavender. Time to prune the Lavender. Photograph by Walter Smith. If you have recently planted roses, shrubs or any hedging then it is very important that they get regularly watered to help them through their bedding in period. Also supply a bark mulch to shrubs that are already growing; this will help them to preserve moisture in the upcoming hot spells. Time to mow that lawn; in this month blades can be lowered to their summer setting. It is also a good time of year to perform maintenance on lawns, sow new seeds into bare patches. The lawn should be edged once a fortnight from now on. It is also a good month to apply a weedkiller to the lawn. Pinch back strawberry runners; this will divert energy into fruit production and lead to a better quality of fruit. Protect the strawberries from the birds by putting up netting towards the end of the month. Supply a mulch to heathers. Spring flowering bulbs such as Tulips should be given a liquid feed. Once they have finished blooming let the leaves die naturally; do not cut off green leaves. Once the leaves have died you can cut them off and supply with the feed. If you are growing raspberries, blackberries etc. then be sure to tie any new shoots to supporting wires. It is also the time to tie up other climbers such as Clematis and climbing roses. If you have planted potatoes then it is a good idea to earth up shoots as they emerge in order to increase yields. To earth up the potato plants simply draw up a mound of soil using a rake along the entire row. Then cover up the emerging shoots to protect them from the light and prevent them from turning green. It is also a good idea to enrich the soil at this time by mixing in a little compost. Once spring blooming plants have finished flowering they should be removed or cut back. At the same time prepare the soil for the summer blooming plants by mixing in some fertilizer; preferably organic. Look out for infestations from black fly on plants such as broad beans. Also check regularly for other pests such as aphids. Also be on the look out for slugs and snails. Winter mulches can be removed. Ensure the compost pile remains moist to aid in decay. Put in stakes for future use next to plants that will require support. It may not seem it at the moment but it will soon start to get very hot in the greenhouse, so it is a good idea to put some shading up in the greenhouse. Also lots of pests will soon begin to emerge, so put up some sticky flypapers. Start off sweetcorn by sowing at a depth of three inches into deep pots. Towards the end of the month or in the beginning of June these can be transplanted outdoors; do so in squares to aid in pollination. It is a good time of year to take cuttings from a lot of houseplants such as Begonias and African Violets. At this time of year it is also possible to take soft shoot cuttings from Fuchsias, Geraniums, Hydrangeas, and Penstemons. You may also want to pinch the tips of Fuscsias to encourage bushy growth. It is also a good idea to give you houseplants a bit of TLC by shining the leaves and removing decayed material. Also many will require regular feeding from now until the end of summer. It is a good time of year to sow the seeds of Basil, Chives, Coriander, Dill, Fennel, Garlic, Mint, Parsley, Thyme and similar herbs into pots and grow them in the windowsill. Greenhouse-grown tomatoes should have their side shoots nipped to ensure maximum yield. Towards the end of the month it could get hot so keep an eye on the plants growing in the greenhouse as they will require plenty of water. Pruning: It is time to cut back perennials, remove dead wood and to tidy up vines. Be sure not to remove flowering spurs that will be bearing flowers the following spring. Trim hedges before winter sets in. Cut back the stems of Dahlia. If you are planning to relocate a tree or shrub then this is a good time of year to carry out that task as the soil should still be warm. Transplanting now will give the plant time to settle in and build new roots well in time for the stresses caused by the following summer. Perform a pH test on the lawn. Ideally grass should grow at a pH close to neutral, so test the grass and adjust with lime if it has become acidic. Additionally it is a good time of year to give the lawn a good feed as roots are growing strongly at this time of year. Take hardwood cuttings of grapes. Plant out lettuce, new potatoes and citrus. It will still be a busy time of year for those growing herbs and vegetables; lots of harvesting to be done. Also herbs can be brought indoors and dried. Now is the time to divide many perennials such as Aster, Canna, Day Lily, Penstemon, Phlox and Rudbeckia. It is a good time of year to go to your local gardening center and purchase bulbs that will flower next summer such as Liliums. Once blooming has finished many species of autumn flowering bulbs such as Amaryllis, Crinums, and Nerines can have their stems cut back. Do not cut back the leaves though, as nutrients will transfer back to the bulb as the plants undergo senescent.